It may have felt like stocks were free-falling Wednesday, but for many of us who were short, making ‘easy’ money was like pulling teeth for most of the day. The broad averages jerked around for hours after falling hard in the early going. As the morning wore on, it felt at times as though DaBoyz were going to muscle shares back to unchanged. They failed at this, however, because shorts hung tough, resisting being spooked into a doing the heavy lifting for bulls. But the fun part of the day didn’t come until the final hour, when the Dow doubled its losses from earlier lows. Some Ricks Picks subscribers still held a bearish put spread I’d recommend on October 12. It was a longshot bet at the time, but we were getting 8-to-1 odds. The bet was on a 700-point decline in the Dow, and it has paid off nicely even if it took a week for it to snowball. To determine whether you could have done the spread yourself, check out the Rick’s Picks Facebook page by clicking here. The video is dated October 12 and appears under the headline Stocks Have Further to Fall — Here’s a Cheap Bet to Play It. My gut feeling is that the so-far mini-crash needs a washout before the stock market can launch into a sustained uptrend. That would be in the context of a likely bear market, however, and although we mght go profitably with the bullish flow for a while, we would not want to be on board when stocks turn lower with renewed vengeance. Bear rallies are supposed to scare the hell out of shorts, so be prepared for some spectacular ones in the months ahead. 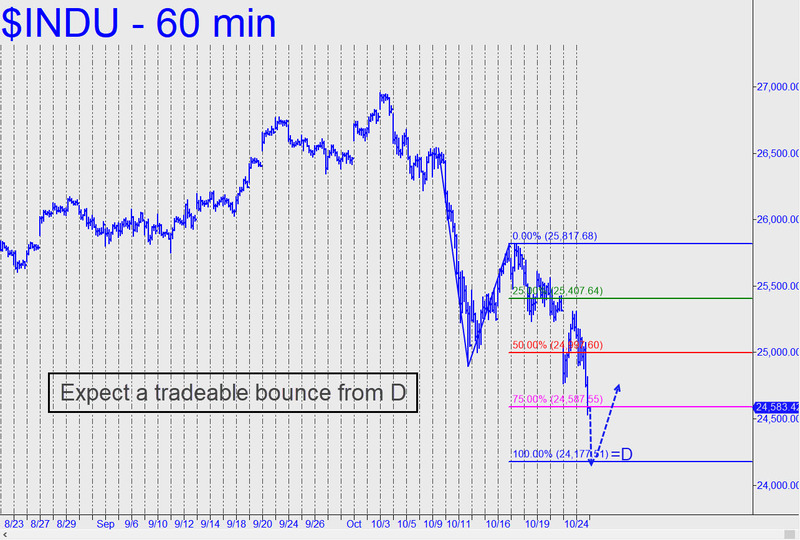 Concerning the washout needed to create a temporary bottom, use the 24,177 target shown in today’s chart. The implied 400-point drop wouldn’t be as satisfying as the 6000-point selloff needed to fully discount the looming crash in housing and autos, but it would be a start. The 8,000 INDU points or 800 to 1000 SPX points are ‘just’ the blow off of a very long bull phase in market value. These points are related towards the Trump Low where the blow off phase begin, where only ‘buying’ took place on balance. This would be similar towards the early 1928 to 1929 rally during a FED hiking phase. The blow off phases are not consider to be a ‘target’ area in value, on the way down they are ‘the adjustment’ just towards the overall trend change and are to be observe how value is to be seen in the future. Once the trend change is confirm values are seen or adjusted towards a more ‘distance’ future, which becomes quite negative over all. Creating a larger trend downward to comment towards. Inverse markets will relate towards the same process but the other way, these items will become the ‘go go investments’ latter and become a bubble in their own time.